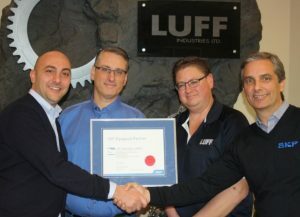 CALGARY – Luff Industries is pleased to announce the strategic partnership with SKF and the introduction of the SKF Equipped program beginning 2018. For the first time in North America an original equipment manufacturer will be integrating SKF bearings into its products through the SKF Equipped program to ensure they are delivering the highest quality products to customers. The Luff Industries team now offers superior bearings as part of the SKF Equipped program. In order to combat roller failures due to bearing contamination Luff Industries’ idlers will come standard with SKF ball bearings. SKF ball bearings are designed with an improved seal, have been greased for life and provide double the L10 life when compared to the competition. Combining the SKF ball bearing with Luff Industries’ high quality rollers and patented end cap design will provide customers with unmatched sealing protection. This will increase the life of the rollers and decrease maintenance and operating costs. After extensive testing it was clear that the SKF Bearings were a great fit for Luff’s range of idlers. Being an ISO 9001 certified company, Luff was able to achieve SKF Equipped status by meeting the high quality standards on the design, manufacture and assembly procedures of rotating equipment set out by SKF. This is an exciting venture for both companies. “We here at Luff are very excited about this new partnership, combining the strength of two world class manufactures delivering the highest quality product our industry has ever seen. This is going to be a game changer,” says Matthew Fasoli, general manager of Luff Industries. Explore Luff’s idlers and pulleys for even the toughest use at www.LuffIndustries.com.